Paranormal super-sleuth Carnacki the Ghost Finder was the creation by William Hope Hodgson. Carnacki would recite details from each case to a group of friends who gathered at his house. During his investigations he’d employ pseudo-science along with arcane magic rituals, often mixing the two, to identify and combat these forces. Some cases turned out to be elaborate hoaxes, but a number of them pitted him against terrifying supernatural entities. 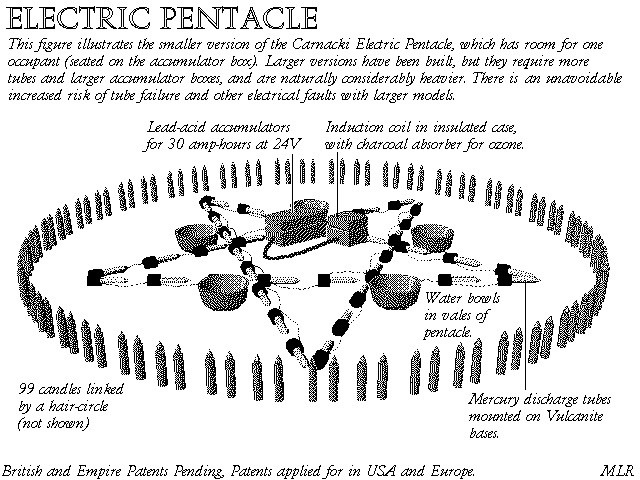 He often used an invention he called the electric pentacle to protect him against otherworldly forces (most often dark spirits he referred to as Saiitii). Most of the Carnacki stories appeared in The Idler magazine in 1910. “The Thing Invisible” was published in New Magazine in1912. The final three Carnacki stories “The Haunted Jarvee” (1929 Premier Magazine), “The Find” (1947 Carnacki the Ghost Finder Collection), and “The Hog” (1947 Weird Tales Magazine) were published after Hodgson’s death in 1918. 1- “Gateway of the Monster” (1910) – Carnacki investigates a house with a room haunted by a vicious entity that strangles people to death in their sleep. The thing that haunts this room is one of Carnacki’s most monstrous encounters. 2- “The House Among the Laurels” (1910) – Carnacki investigates a large manor house in disrepair that’s reputed to be haunted. It’s said that just before the horrible things occur, blood starts pouring from its walls. Carnacki sets up his magical defenses to protect himself and several villagers who have been prompted to help. He’s shocked when the defenses fail, and the whole group is endangered. 3- “The Whistling Room” (1910) – This story made me a fan of Hodgson’s work. In it, Carnacki investigates a room in an Irish castle from which a whistling sound emanates. The room is haunted by something supernatural and extremely powerful that push Carnacki to the limit. I love the imaginative form this thing takes and the spooky reason behind the haunting. This is my favorite Carnacki tale. 4- “The Searcher of the End House” (1910) – In this case, Carnacki is investigating his mother’s house. Doors slam at night when no one should be present, and an inexplicable smell of mildew is often smelled. The house is said to be haunted by the ghost of a woman searching for her ethereal son. 5- “The Horse of the Invisible” (1910) – The first born female of the Higgins family is said to be cursed by an apparition of a horse when she begins courting a mate. Much to everyone’s surprise, the legend appears true when Mary Higgins starts to hear mysterious hoof beats in the night. Things accelerate during Carnacki’s investigation when Mary and her fiancée are physically attacked by something with an enormous horse head. 6- “The Thing Invisible” (1912) – Carnacki is asked to look into a murder that took place in an old chapel reportedly committed by an animated dagger. 7- “The Haunted Jarvee” (1929) – Carnacki investigates a friend’s ship The Jarvee, which has a reputation for being haunted. This task is made more dangerous by the fact it’s at sea during his investigation. This means he must not only deal with the ominous shadowy forms that swoop across the water from every direction but also survive deadly supernatural storms that threaten to rip the ship apart. 8- “The Find” (1947) – This is a non-supernatural mystery solved by Carnacki about a rare, exceptionally valuable book of which only one copy of was supposed to exist. A second copy surfaces and is verified as authentic by three experts. It must be determined how a second copy from the same time period exists when everything pointed to there being just one. 9- “The Hog” (1947) – Carnacki faces great peril from a dark entity that takes the shape of an immense hog that has been terrorizing the dreams of Carnacki’s client. When Carnacki uses new equipment to try and figure out the cause, he finds himself trapped in a small protective area, looking down into a hellish pit in the floor where the demonic Hog is moving towards the surface, attempting to gain access into our world. True. I know there have been several recent writers that have written new Carnacki stories. There was also a decent Carnacki RPG available online a few years ago.